This post discusses the various graph data structures I have tested. A few days ago I briefly discussed the same in this post. I plan to elaborate more here and also discuss the CSR representation. The tests have been done from the point of view of feasibility to use for Region Adjacency Graphs ( RAGs ) . These images I am testing with are from a (5µm)^3 volume of D. melanogaster larval neuropil imaged at 10x10x10nm resolution using focused ion beam scanning electron microscopy (FIBSEM) ( courtesy Juan ) . The image is 500 x 500 x 500 pixels ( ~500 MB ) . I am also using two images from SNEMI 3D Segmentation challenge of 1024 x 1024 x 100 pixels. Although I am yet to handle them, Juan has pointed out that typical images he has worked on have had 8000 x 8000 x 8000 pixel resolution with close to 100,000 nodes. If we use a typical adjacency matrix with 8 bit unsigned entries, that would consume 9.5 GB. However the edges in a RAG is comparatively low, as compared to the maximum number of possible edges. Thus, we need a data structure whose storage requirements are a linear function of the number of edges. My initial intuition was to design a class by wrapping a thin layer of code around one of scipy’s sparse matrix classes. But collapsing edges ( joining two nodes ) is something not easily possible in any of these formats. Hence we decided on implementing our own data structure from scratch. To test the 4 possible that we came up with, I am constructing the RAG for the image, and randomly merging nodes till there are only 10 left. The source code and the benchmarks can be found here. See graph_lil.py and rag_lil.pyx. This is the typical adjacency list representation, except the lists aren’t lists, they are numpy arrays. The list of neighbors is also sorted in each case to optimize the lookup ( see add_edge function ). This also makes the code a little more complex than the other approaches. Out of all the approaches, this is the most memory efficient, but also the slowest, since adding an edge and merging nodes requires a lot of memory movement. Apart from the image, the only thing consuming significant memory is the construction of the RAG. Since line_profiler wouldn’t work with Cython, the output comes from Cython’s in build profiling.From the below output, it’s clear that insert and searchsorted functions consume the most time. search, insert, and delete are consuming the most time in this case. See graph_nx.py and rag_nx.pyx. This is a subclass of networkx.Graph. The only additional feature I added was the merge function. NetworX mainains a dictionary per node of its adjacent nodes. Each edge has it’s own dictionary for maintaining it’s properties. This leads to increased memory usage. Because O(1) lookup in dictionaries, edge addition and contraction is very fast.As Juan pointed out to me because of the small load factor of Python’s dictionaries, most buckets remain empty. Dictionaries also have to store the key, as well as the value. Therefore, this required the 2nd highest memory amongst the tested approaches. Juan used a similar approach for his project here and has reported ~100 GB of RAM usage. Graph construction consumes memory, and merging frees up space because we delete one of the merged nodes. Since the function to add edges comes directly from the netwrox class, I haven’t profiled it. Here we have a line by line time profiling bu using the line_profiler module. The most significant contribution is by looping through the neighbors to get edge weights. See graph_custom.py and rag_custom.pyx. This is something me and Stefan came up with during a chat. This is similar to NetworkX’s approach, but the nodes are stored in a list instead of a dictionary. Also, instead of maintaining a dictionary for a property ( like weight ) per edge, we maintain one dictionary per node, where the keys are the adjacent nodes and the values are the weights. Both the Custom as well as the NetworkX representation have comparatively more memory requirements than LIL because dictionaries have to store the key and value, and also due to the small loading factor of Python’s dictionaries. 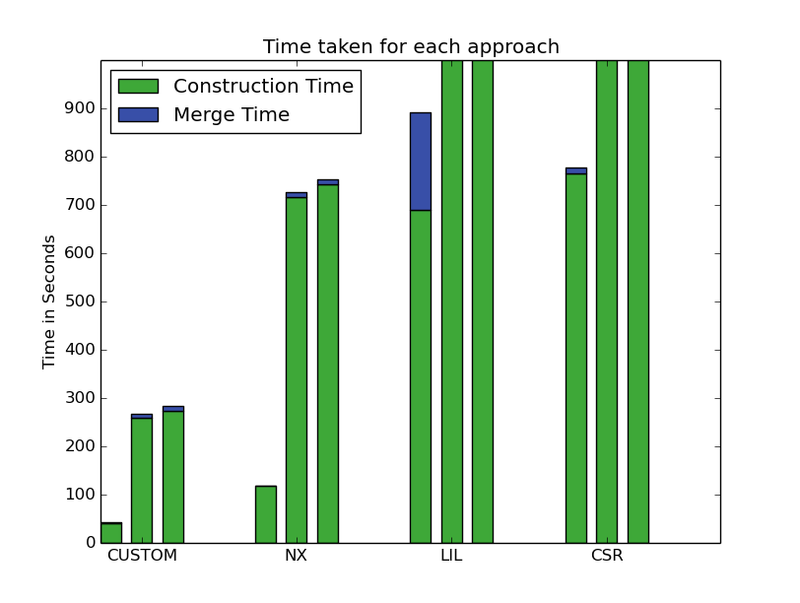 Although not the most efficient in terms of memory, but it’s the fasted for construction of graph and merging of nodes. Again, we see that the RAG itself adds to the memory other than the image. Merging nodes does not result in a significant decrease in memory because, one of the merged nodes still holds an empty dictionary. The dictionary update and the look up, take the most time. Maintaining edge count was done only for test purposes. Making new edges takes the most time. See graph_csr.py and rag_csr.pyx. This is inspired for the scipy’s csr_matrix. To account for merging of nodes, we append the data of the merged node towards the end of indptr, indices and data array ( merge function ). We invalidate the merged nodes by setting a valid flag to False. These arrays keep doubling in size whenever required ( double function), which leads to O(1) amortized memory movement cost. 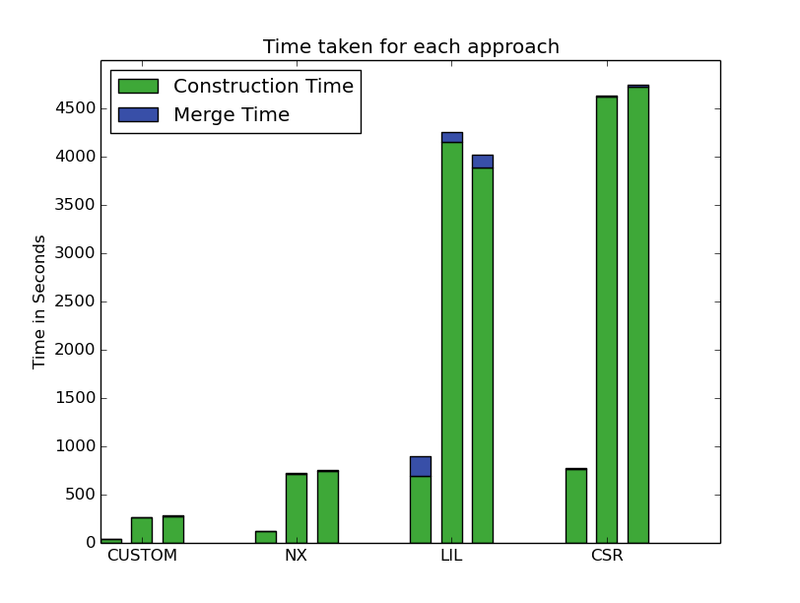 The merging code is also almost pure cython with very less Python calls, which makes it faster than the LIL approach. As we later discovered, the doubling happens 7 times for our test case, which leads to a 256 times increase in the array size. This results in the highest memory usage among all approaches. Apart from the graph, merging increases memory usage. This is because the arrays double their size, which can happen any number of times. For this particular case, it occurred 9 times. For test purposes , this was done using scipy’s dok_matrix. We have to profile Cython code again. As expected, doubling the array and copying elements, take the most time. The time taken for each approach for all 3 volumes used. 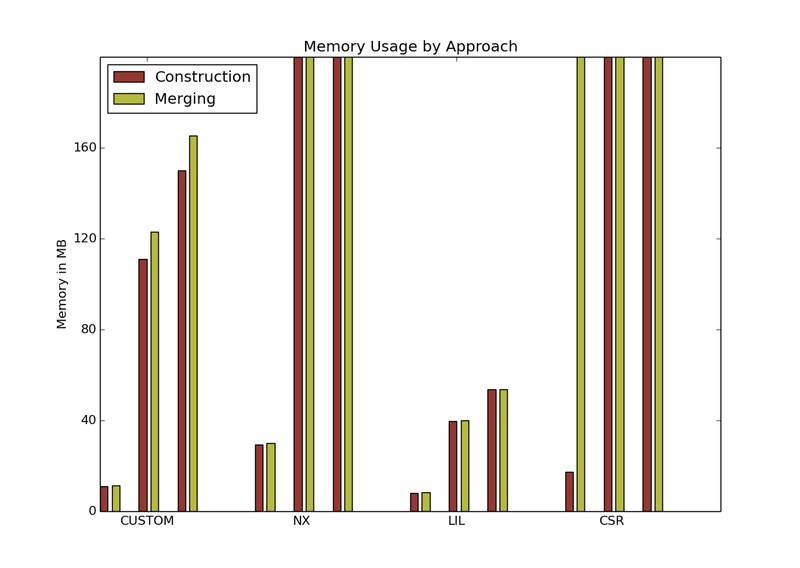 This plot shows the maximum memory usage for each approach. 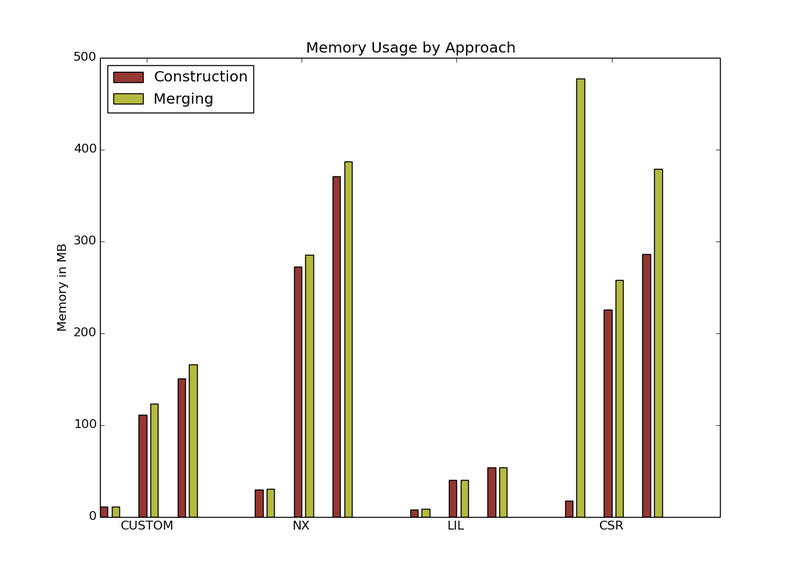 Notice That for the CSR approach, for case 1, the memory usage during merging is significantly higher. This is due to the fact that, doubling of the array, can happen any number of times. Thank you for taking such care in writing up this insightful blog post, Vighnesh. Could you comment on why the LIL representation uses so much less memory? Also, what is your feeling about a parallel implementation where we give the user the option to choose whether they want fast computation or reduced memory use? Would that be feasible? I have added a line about that. It is because Custom and NetworkX representations store keys as well as values, and also doue to the small load factor, many buckets in the ductionary are empty.